Frozen Diamonds is a 5-reel 20-payline video pokie developed by the Austrian pokie developer Rabcat in the collaboration with Microgaming and running on their Quickfire platform. The pokie features elaborate 3D graphics and smooth animations accompanied with a dramatic music score adding excitement to the gameplay and contributing to the overall atmosphere of the game. All icons are depicted as ice cubes with various symbols frozen within them. While frozen diamonds deliver high payouts, low value prizes are delivered by playing card symbols. Instead of standard spinning of the reels, you will see your symbols falling and special features including respins and free spins work the same way. We love that we can finally play a game featuring decent graphics at Microgaming casinos. This pokie looks really great and we especially love how the symbols included in winning combinations explode to leave the space for a new set of symbols to fall. It happens due to the Bonus Falls feature which is triggered as soon as you hit a win. You can win two Bonus Falls and when you hit three consecutive wins, you trigger the free spins feature. 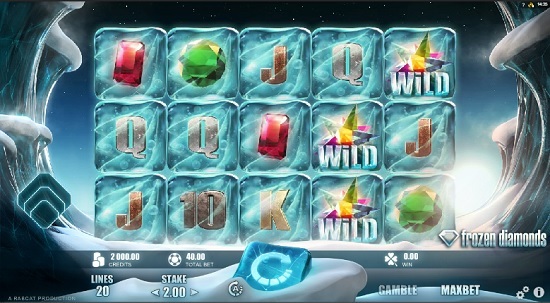 Although you can benefit all the way from Wild depicted as a multi-coloured diamond with spikes, during each first spin within the free spins feature your central reel will be covered by two or three Wilds which can help you hit multiple winning combinations by substituting for all other symbols. As Bonus Falls are active during free games too, after the second successful Bonus Fall you get an additional free spin with three Wilds added to your central reel and all payouts from it doubled. This can be the point of the game when you can create the most lucrative winning combinations. With two top value symbols delivering only 100 coins for five of a kind, we don’t have to say that payouts are quite low. Although you can create multiple winning combinations from a single spin, that doesn’t mean that winnings should be as low as they are. The number of free spins awarded can vary between 5 and 10 free games and they are randomly awarded. The theme of the game featuring diamonds has been seen so many times that it is a commonplace in the gaming industry. The game is worth playing despite its disadvantages because of all respins which offer you an additional chance of winning and rewarding free spins with enhanced reels and the possibility of hitting doubled payouts. Look out for Wild as it delivers the top jackpot prize and substitutes all other symbols to complete as many winning combinations as possible. The game is affordable for all kinds of players and you will enjoy a refreshing and exciting gaming experience as soon as you press the spin button or activate automatic spins to enjoy the smooth gameplay to the fullest.